InLoox PM — Start Your Free Trial Today! No credit card required. Full-featured Trial. Unlimited Projects. Start your first project with InLoox today — it only takes a few minutes. 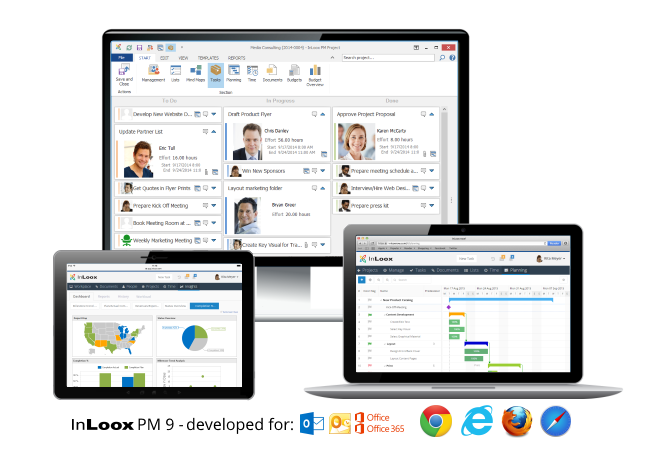 The InLoox PM test version allows you to experience InLoox PM for Outlook free of charge. Up to 5 users can test the full-featured trial-version for 30 days. If you prefer to test the online project software InLoox now! Web App, please click here. What happens when I click "Download Free Trial"? Enter your name and email address in the request form and click on "Download Free Trial". A window opens with a step-by-step installation guide. First, select your preferred testing option: the single user version (InLoox PM Personal) or the team version for up to 10 test users (InLoox PM Team) then follow the set-up und installation instructions. Your personal license key is displayed at the top the page and it is also emailed to the email adress you've entered before. The software will not be installed automatically to your system. No. The test version is absolutely free of charge and you do not commit to any follow-up acquisition of the software. We do not require any payment information for the trial download. The test will end automatically after 30 days. You can remove InLoox PM completely from Outlook and your system at any point. If you decide on purchasing the software you can continue working with the projects that you have already started during the trial period. Simply enter your permanent license key that you'll receive upon purchase and continue working with all the exisiting project information. Do you want to test our SaaS solution? InLoox PM Free Trial • Copyright 1999-2019 © InLoox, Inc. All rights reserved.